The touring segment is slow to change. Honda’s Gold Wing is always a contender and could easily take the win or the runner-up, and so too could numerous full-dressers from cruiser manufacturers. But in our opinion, nothing matches BMW’s K1600GT/GTL when it comes to combining all the comfort and amenities expected of modern mileage gobblers, with the performance and handling capabilities of more nimble sport-tourers. We even included the GT model in our 2014 Heavyweight Sport-Touring Shootout and the Beemer crushed ’em. Likewise, the GTL basically bested the GL in a head-to-head back in 2012 (2012 BMW K1600GTL Vs. 2012 Honda Gold Wing Shootout) with us giving the Honda a fair shake in the closing paragraphs. 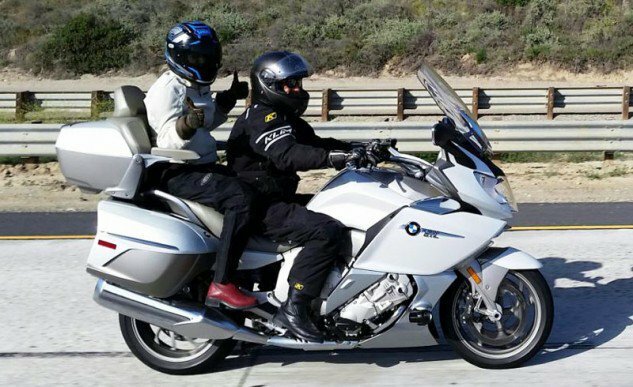 “While reducing the Gold Wing’s weight and upping its horsepower would be beneficial, regardless of its competition, we feel it would be silly for Honda to chase BMW for the best performing luxo-tourer and stick with what the Gold Wing does best – delivering unmatched comfort in long-distance, two-wheel travel. 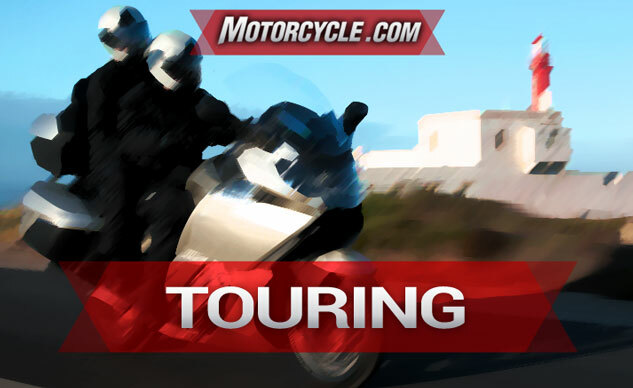 The K1600 outfitted in either GT or GTL guise is sportier than anything else in the Touring class. Its Duolever front end and optional electrically adjustable suspension deliver excellent composure at high speeds and deep lean angles. The inline six-cylinder sings like no other touring engine while delivering exhilarating acceleration. The BMW K1600 remains, and will remain, the ultimate expression of touring perfection in the slow-to-change touring class until Honda, or another OEM (possibly BMW itself) steps up with a new game changer – like BMW did with the K1600 or Honda with the Gold Wing before it. As we did with the BMW K1600GT/GTL, we’re sticking with lighter weight and better performance for our Honorable Mention selection, but our choice is the polar opposite when it comes to complicated electronics, high horsepower and Autobahn styling. Harley-Davidson arguably has more touringish models in its lineup, but when the Motor Company reintroduced the Road Glide in 2015 we fell for it and all its Project Rushmore upgrades. 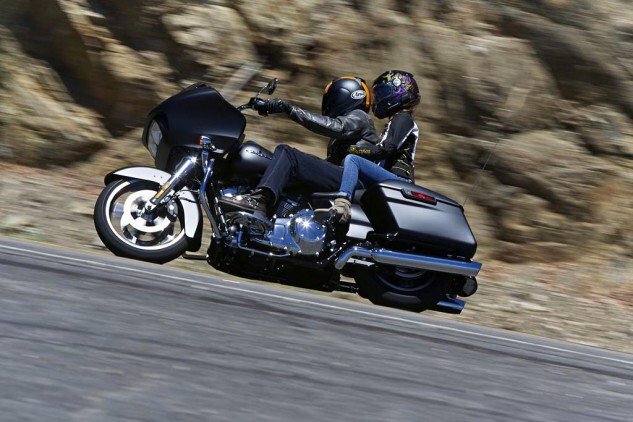 When it comes to liking the cut of one’s jib, no motorcycle owns a profile quite like the Road Glide’s. Not only is the Road Glide unique in Harley-Davidson’s line-up, but also in the realm of cruiserdom. Others emulate the fork-mounted, batwing fairing of Street Glides and Ultras, but the Road Glide’s frame-mounted fairing and its distinctive styling sets it apart from the crowd. With the launch of the 2015 model, the Road Glide boasts a high-output Twin Cam 103 engine, dual Daymaker Reflector LED headlights, triple splitstream fairing vents, color TFT Boom! Box 4.3 infotainment system, a swept-back handlebar, one-touch hard saddlebags, cruise control, adjustable air-ride rear suspension and new ergonomic hand controls. Ridden within its design parameters, the RG rewards its pilot with confident, competent handling. Pushed outside its comfort zone and you might use up the rear shock’s limited travel and bottom out a hard part, but if that’s what’s happening maybe you should be riding the touring bike highlighted above.